In the world of entertainment the actors are the true factors they say who can mean the difference between a hit and a flop production. These actors work tirelessly to create truly entertaining films and TV series that are the source of entertainment for the viewers and the channel for exhibiting their acting skills for the artist. It is no wonder then that these actors get paid handsomely for their talents and celebrity status that they achieve with their fans worldwide. Jerome Allen ‘Jerry’ Seinfeld is a very popular American stand-up comedian, writer and actor and is currently ranked as the richest actor in the world with a net worth of around $820 million. 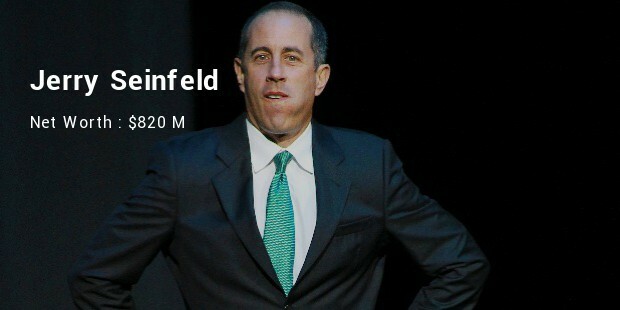 Apart from being a renowned actor he is best known for his comedy series Seinfeld. Shah Rukh Khan is one of the most popular of the three prominent Khans in the Indian Bollywood film industry. His personal net worth is around $600 million. 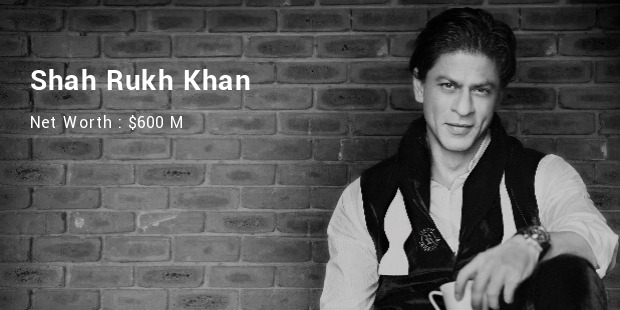 Also known as ‘King Khan’ or the ‘King of Bollywood’, he is a versatile actor but is best known for his romantic roles with most of the top actresses of Bollywood. Being a millionaire, Shah Rukh Khan is big on philanthropy and is attached to the UNESCO’s program for under-privileged children from around the world. Tom Cruise is a popular American actor and film producer estimated to be worth around $480 million. 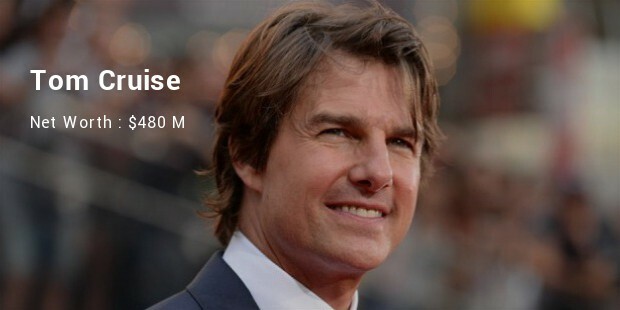 He is known for his remarkable roles in action films, such as the Mission Impossible franchise, Minority Report, Tropic Thunder, Top Gun, Few Good Men, etc. 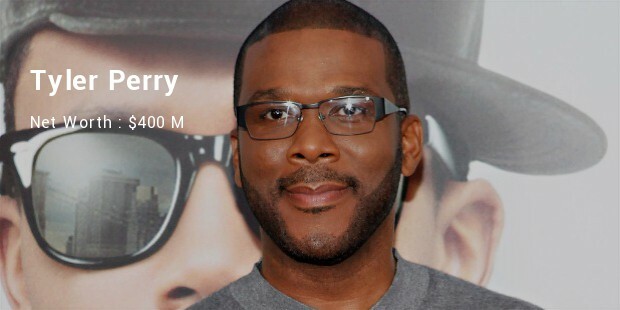 Tyler Perry is a famous American actor, director, producer, songwriter, author and musician. This multi-talented artist is estimated to be worth around $400 million. Tyler has been involved mainly in writing and producing various stage-plays in the 1990s and 2000s. He is also known in the celeb circles as being an exclusive partner of famous TV personality, Oprah Winfrey. Johnny Depp is undoubtedly the most versatile and talented American actors in Hollywood. He is estimated to be worth around $400 million. 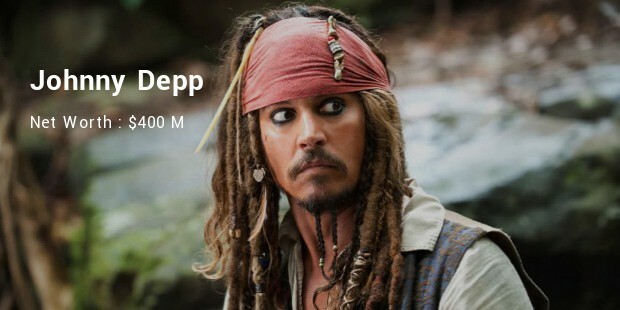 Best known for playing the quirkiest and most unique roles in films, he is best known for portraying the adventurous and chronic drunk pirate Captain Jack Sparrow in the popular Pirates of the Caribbean film franchise. Apart from this he is known for memorable roles in movies such as Edward Scissorhands, Sweeny Todd – Barber of Fleet Street, Charlie and the Chocolate Factory, Alice in Wonderland, etc. 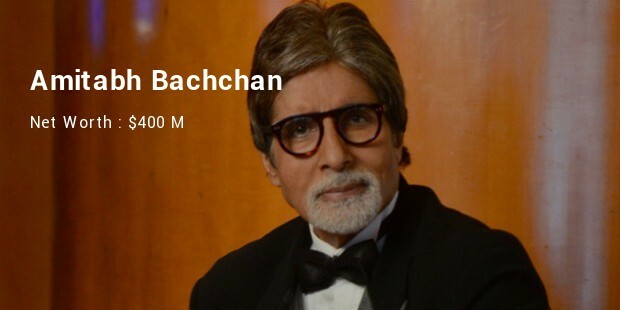 Amitabh Bachchan is a legendary Indian actor from the Bollywood film industry. He is estimated to be worth around $400 million. Earlier known as the Angry Young Man of Bollywood he is now affectionately known as Big B due to his tall stature. His acting career spans more than 4 decades and includes various memorable films and blockbuster movies, such as Sholay, Zanjeer, Khuda Gawah, Agneepath, etc. Bill Cosby was a legendary comedian and movie artist who recently passed away yet retains a spot on the list with an estimated worth of around $400 million when he passed away a few months back. 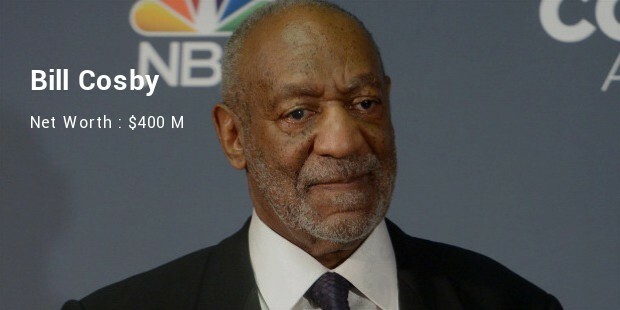 The Bill Cosby Show was one of the most popular TV shows of the era and he is known as being the inspiration and motivation to various other African-American actors and comedians lately. 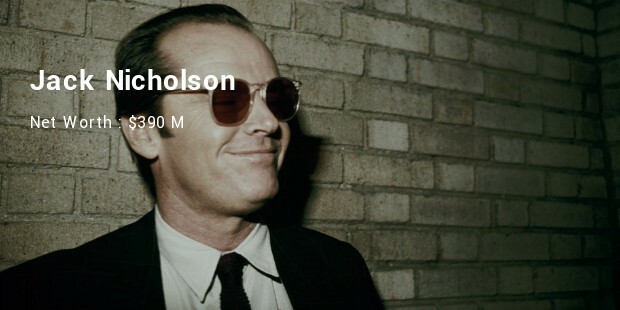 Jack Nicholson is a legendary and talented American actor who has been versatile in his choice of roles. He is estimated to be worth around $390 million. Jack is known to have played truly remarkable roles in hit movies such as The Shining, Few Good Men, etc. His vast range of facial expressions and peculiar dialogue delivery style makes him a favorite amongst his fans worldwide. Clint Eastwood is a legend in his own rights. He is a popular American actor, director, writer and producer. 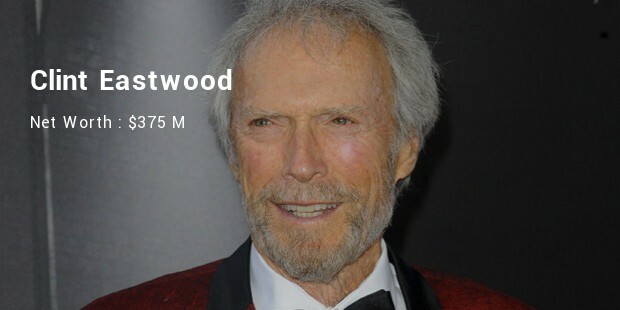 Estimated to be worth around $375 million, he is known for iconic roles in western thrillers and action movies in his earlier days as well as some intense and award-winning roles recently in his career as an actor. 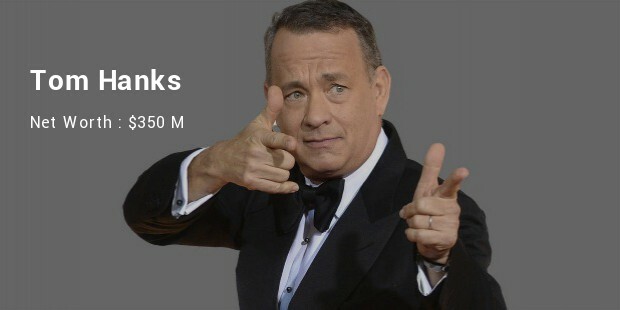 Tom Hanks is a popular American actor, screenwriter, director and producer. He is estimated to be worth around $350 million. He has received wide praise for his acting skills in a plethora of movies such as action-packed award-winning war drama Saving Private Ryan, action-comedy Forrest Gump, thriller The Da Vinci Code, etc. These are the millionaire actors who entertain the world with their vast range of movies and TV shows. These actors are all legends in their own rights and have some of the largest fan-following across the globe.